To fetch all data from database, one more page in Model folder of CodeIgniter will be created. There will be some changes in controller's and view's files also. 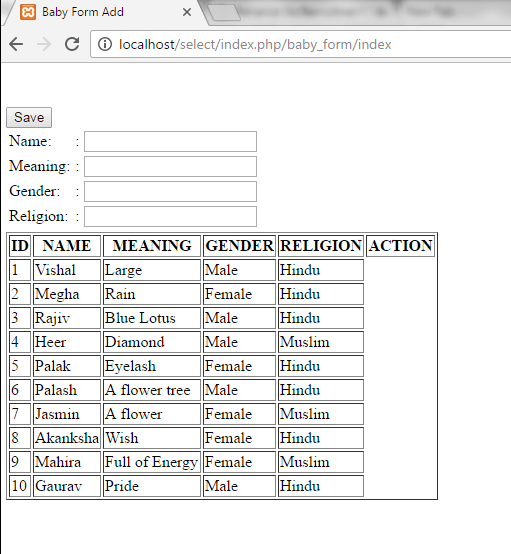 Controller file (Baby_form.php) is shown below. View file (baby_form_select.php) is shown below. Code in baby_form_select.php file is same as baby_form_add.php. Above codes are added to fetch the record. Here we have fetched the record in a table with the help of foreach loop. Function fetchtable() is created to fetch the record. Model file (babymodel.php) is shown below. Look at the above snapshot, all data has been fetched from the table 'baby'.